From time to time the Chair and General Secretary of the Moray Coast U3A receive communications from National Headquarters or from the Scottish Leadership. These communications often give details of conferences or courses which may be on interest to members. Your committee has decided that this material should be made available to the general membership via our website. If you require any further information about any of the courses or conferences listed then contact the organisers using the contact details given on the form(s) you have downloaded. There are numerous action days throughout the season. A copy of the U3A in Scotland Newsletter is available to download by clicking on the link on the right. 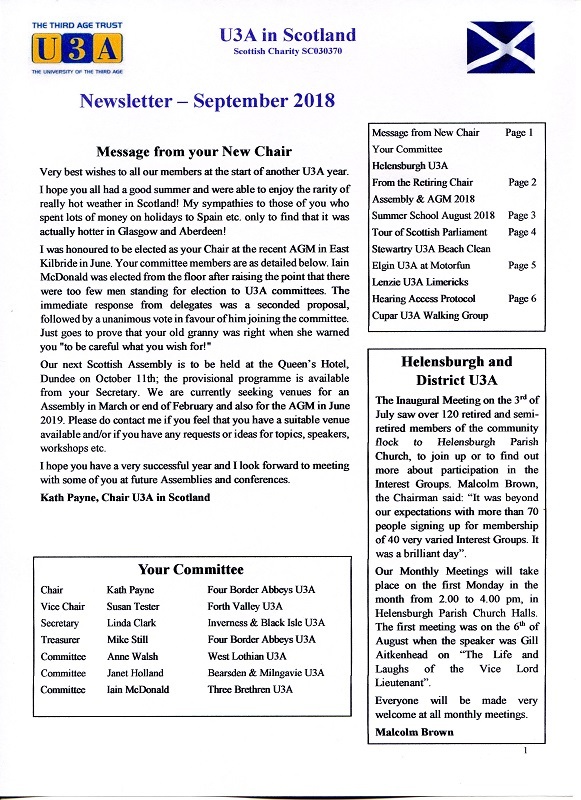 It is suggested that all Moray Coast U3A members should read the newsletter to acquaint themselves with the current business of the U3A in Scotland. A copy of this Newsletter is available to download by clicking on the link on the right. It is suggested that all Moray Coast U3A members, and particularly Committee Members, should acquaint themselves with this document. The subject of our January 2019 Monthly Meeting was the work of the Boyndie Trust and the Banffshire Partnership in an excellent talk given by the Chief Executive, Duncan Leece. A flyer about the Old School, Boyndie, Visitor Centre and Restaurant can be downloaded from the link on the right. The Conversational French Interest Group seems to be a victim of its own success. This group now has twelve regular members but because the group meets in member's houses the group, as a whole, feels that we now have to cap the size of the group. Twelve seems to be the maximum number that can be seated in most member's lounges, especially as one also needs some room for books etc. The Moray Coast U3A Committee and the Conversational French Group Leader will review the situation regularly. If you wish to join this group then please contact the group leader using the link on the Conversational French Group page. Your name will be added to a waiting list. If numbers are sufficient then a second Conversational French Group will be formed. The Moray Coast branch of the U3A is planning a new “Desert Island Disks” interest group. It is hoped that the group will be launched in March so look out for more information. The format will follow the classic Radio Four format. For the first session it is expected that the first guest will be Dr. Ann Rennie and the interviewer will be our Chairman, Joan Coverley. Dates, times and the location of meetings have yet to be finalised but look out for news about this planned group. All Moray Coast U3A members will be notified by email prior to the launch on this new group.